DMG artist and Director of the Victorian College of the Arts (VCA) Jon Cattapan is the first artist to create a limited edition of prints in a new VCA project – or, as he puts it, he is “the guinea pig” of the project. 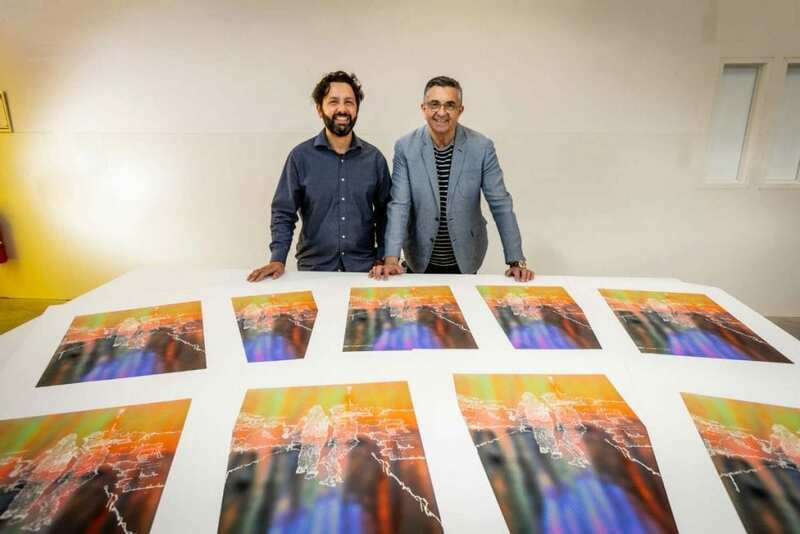 Developed out of conversation between the Head of VCA Kate Daw and Head of Printmaking Dr Mark Dustin, Cattapan’s work will be donated back to the VCA as part of fundraising efforts. The prints are a result of a multi-step process that began with the bright, intensely-coloured background of one of Cattapan’s pre-existing works. This image was then treated heavily in Photoshop and printed digitally by Andrew McLaughlin at the VCA Digital Hub. Over the course of two mornings, the white overlay featuring two figures was then individually screenprinted over the top of the digital prints by the artist and print publisher Trent Walter, who started teaching in the VCA screenprinting studios in July this year.